Recorder Cup & VFA Medal (1940-41) - from 1933 to 1941 the VFA presented two separate Best & Fairest awards, with each award being decided by a different voting system. The errors surrounding the 1940 and 1941 awards are a classic case of a factual error being perpetuated until it becomes accepted as fact. The incorrect list in The Pioneers was subsequently used as the source for: Everything You Ever Wanted to Know About Australian Football... (1982) by Graeme Atkinson. 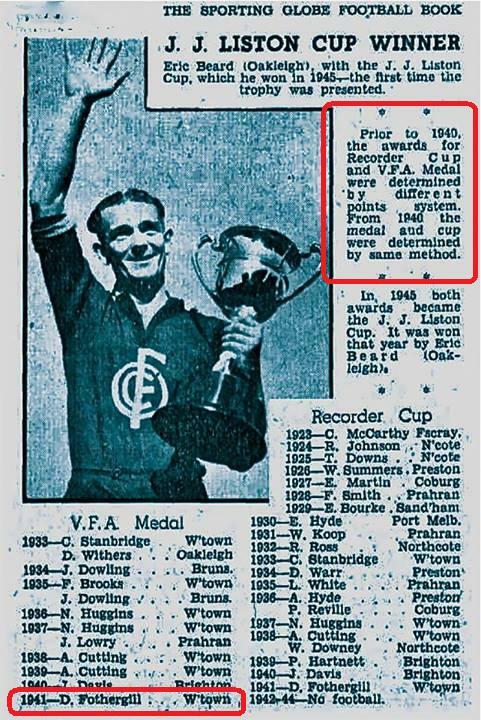 As mentioned above, there were no votes awarded in the 1940-41 Recorder Cup, so the totals shown are most likely the number of best on ground votes each player received (the VFA Medal voting system allowed all of the umpires at a match to cast votes - 2 votes for best on ground and 1 vote for second best on ground). 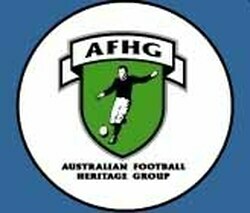 The pioneering football website FullPointsFooty uses the 1977, 1982 and 1989 lists as its source for a table of VFA Medallists which correctly has Des Fothergill as the winner of the 1941 Recorder Cup but shows no VFA Medal presented in 1941. The site's popularity and the ease with which information can be viewed and disseminated in the internet age ensures other modern sources such as Wikipedia [since corrected] and the like turn the 1977 and 1989 errors into reality.